Hello Everyone! It's Michelle here today. I was trying to decide what I wanted to share this month and then it hit me...Hero Inks. I just picked up the two newest members of the Hero Hues family so I thought I would share some cards made with Just Rust and Pumpkin Pie. If you have not picked these 2 colors up I urge you too. ASAP. 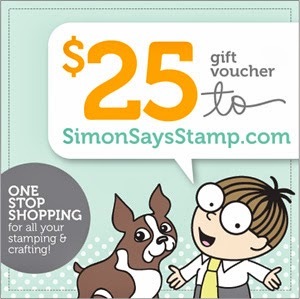 I do know that Simon Says Stamp just got them restocked. They are just AMAZING colors. All the Hero colors are AMAZING and I find myself shocked when I hear that someone hasn't tried them yet. I use them on just about every single project I make. I started with the Maple leaf and from top to bottom I inked Pumpkin Pie, Butter Bar, Soft Apricot, Just Rust and Red Royal. I know it's a lot of colors for one little stamp but they came out so pretty. I inked them all similarly, cut them out and then stamped the acorns in Latte Chalk ink and Cup O' Joe mid-tone ink. The wreath of leaves is inked in the Forever Green mid-tone. The inks blend beautifully and this next card shows that. 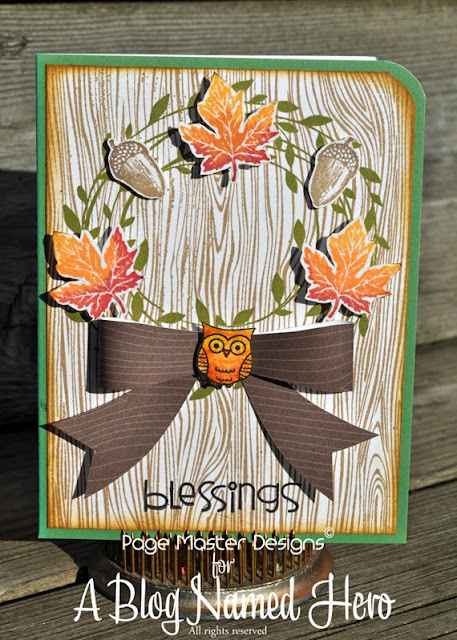 This card uses Butter Bar (mid-tone ink), Soft Apricot (shadow ink) and Just Rust. I applied it with a Foam tool the same way you would apply Distress inks. It worked beautifully. I also stamped over it with Versamark and used some Inference Green Perfect Pearls on it. 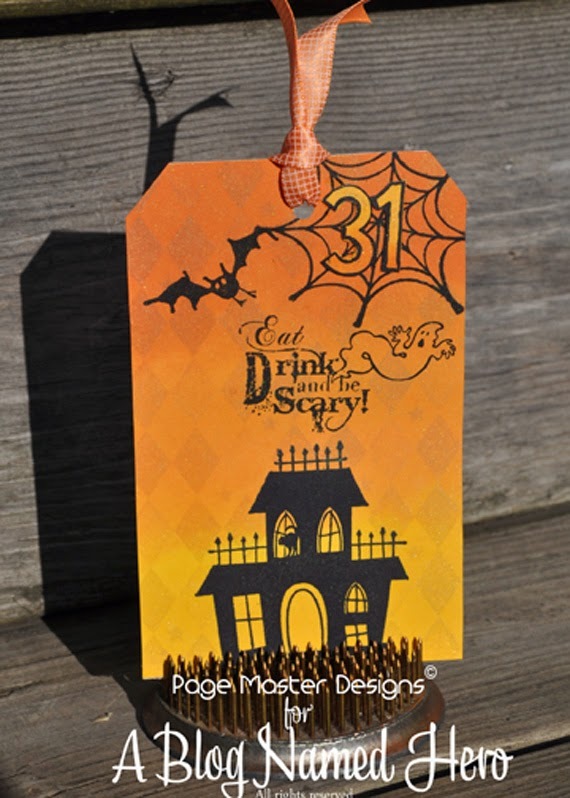 I am in the midst of getting my Boo Baskets ready to Boo my neighbors and I thought these tags would be so fun to add to them. The sentiment on this card come from Darcie. Lastly, I have a very simple card that uses Hero Hues but in a different way. I used a Hero Hues Note card in Mandarin and then I inked up the tweed background stamp in Just Rust. I die cut the ghost tag using a Hero Arts digital shape, available in the Silhouette store. I really love the way the Just Rust compliments the Mandarin note card. It's the perfect marriage. 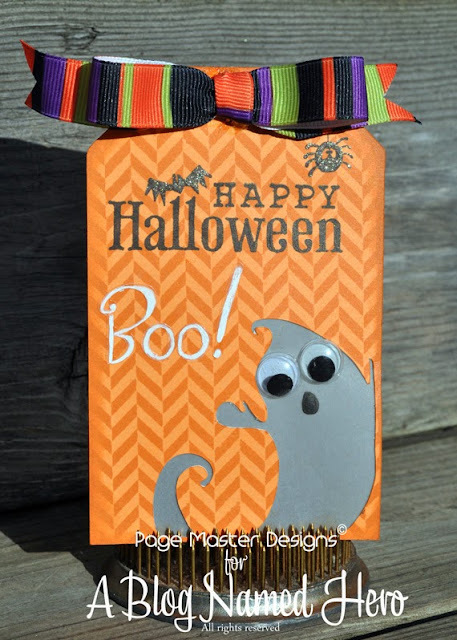 I put some Vellum behind my ghost, added a sentiment, some stickers to spell Boo and a bow. This one will go into a Boo basket too. I hope you got a better look at these magnificent colors. They are just superb in every way. Don't forget to enter our latest challenge for card sets. You could win this!